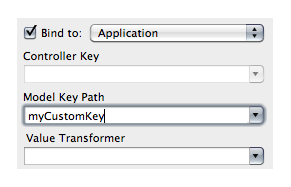 Good news is, you don't have to use AppleScript to enjoy the benefits of extra keys ! NSApp can become a way of sharing instances across NIBs, or a central repository of data. Update the key with [NSApp setValue:@"hello" forKey:@"myCustomKey"]. Binding to NSApp using mainWindow.windowController.document will give access to the current document. To implement an inspector, load an external NIB and bind to that keyPath. Another way is to set a custom key : when selecting an object, update a key containing the selected object [NSApp setValue:selectedObject forKey:@"selectedObject"] and bind the inspector to it. When calling an unknown method, Cocoa will try to forward the call using forward invocation. It gives you a chance to handle the unknown method yourself and do whatever you want with it : call a proxy object, change the method name and its params, or just discard the call. First, decide in methodSignatureForSelector: whether to handle the call or not. If so, you'll need to return a signature describing arguments and return type of the method you'll call in place of the unknown one. To discard the call, just return nil. The signature itself is made up of type encodings, but you don't have to deal with those directly as you can use methodSignatureForSelector: to return the signature of the method you'll actually call. Then, handle the call in forwardInvocation:. The NSInvocation given as parameter gives you the original selector and its arguments. As a Cocoa method is actually a C function taking instance and selector as its first arguments, the unknown method's arguments actually start from the third argument. To accomplish this, we'll add forward invocation to NSDictionary to redirect zero parameter calls to call valueForKey: and one parameter calls (starting with set) to setValue:forKey:. The downside of this sample is that XCode will complain about unknown methods. Nonetheless, it's nice to see that you can do it. That's a subtle one. 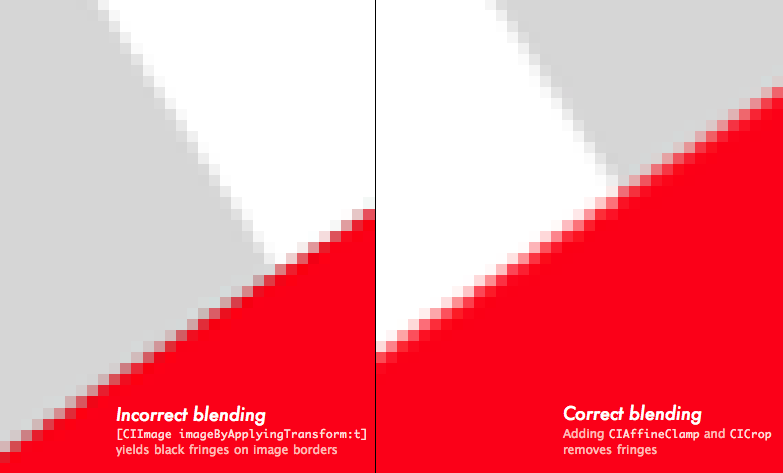 When rotating a CIImage with [CIImage imageByApplyingTransform:t], you'll see incorrect blending between the image and its background. 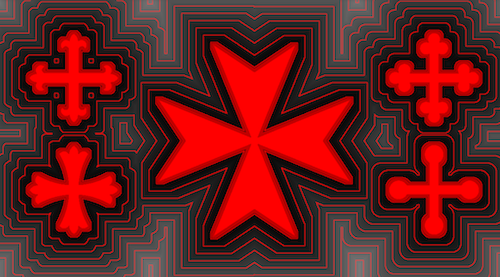 In this case, a black and grey image on a red background shows darker interpolated pixels than exist in both image and background. Core Image is by default assuming a black border when blending the image. CIAffineClamp mentions black fringes when using a Gaussian Blur — when blurring, Core Image will blend border pixels with black. Adding CIAffineClamp will extend the image infinitely to blur border pixels with a copy of themselves. Any filter that starts blending out-of-image pixels will benefit from CIAffineClamp — this will remove black borders in CICrystallize, CIPointillize, … and all the blur filters. Cocoa provides NSTask to run subprocesses. It can be used to run shell scripts, but all this manual pipe and file handling is a bit cumbersome. Fortunately, for a simple script, we can use the trusty old system and redirect its result to a file. In this case, ls lists all crash reports from new to old, grep keeps only yours, head and tr extract the result by keeping the first line and removing the trailing newline. Getting the path is now only a matter of reading the temp file. NSThread's callStackSymbols will dump the call stack in an array. What is usually the realm of gdb, callStackSymbols will do at runtime. Writing recursive code and stuck with a method definition that does not specify the recursion depth ? Count how many times the method appears in the call stack. It will call the original NSLog and pinpoint the offending function. 2 Enumeration Looking for an object in an array can be done with a block enumerator. Set stop to YES to stop enumeration. The one advantage enumerateObjectsUsingBlock: has is the current index. enumerateObjectsWithOptions:usingBlock: lets you go backwards. // At last ! Our shiny new object ! How about a block ? 5 Functional style Nicolas seriot wrote about functional code in ObjC before Snow Leopard was out, hinting at using blocks to implement functional style code in ObjC. Strangely enough, Snow Leopard didn't implement these. NSArray does have a indexesOfObjectsPassingTest: method, but it returns a NSIndexSet instead of an array ?! With blocks, we can implement a filter method that will create a new array collecting objects matching our block condition. This removes the need to loop over array element ourselves when we only want to extract elements. Just supply a condition and voilà ! A new array. 6 List comprehensions are a shorthand way of creating arrays. 7 Async processing This is a simple piece of Grand Central Dispatch : enqueue an asynchronous job. The function will return immediately while the block performs in the background in another thread. Use performSelectorOnMainThread: to update your GUI afterwards. 8 Async monitoring Another piece of GCD, lifted from the Concurrency Programming Guide. You can use GCD to monitor asynchronously resources. In this example, a dispatch source is set to watch when a file is renamed. One block handles notification, another handles common cleanup. // Called when the file was renamed. // Start watching file rename. Call releaseDispatchSource when done. There are even more uses of blocks, as Grand Central Dispatch uses them extensively to perform concurrent tasks. I encourage you to read the Concurrency Programming Guide.